"A trillion timelines, and all at war. Like a thousand red flowers growing in a black garden." 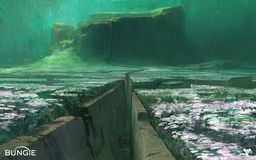 The Black Garden is a realm isolated from space and time and inhabited by the Vex. It houses the Black Heart, an entity that is intrinsically linked to the Darkness, and is tended and guarded by the Sol Divisive collective. The nature and purpose of the Black Garden is one of the longest-running mysteries known to the scholars of the Tower. The Black Garden is a place where "everything grows" and where "abstract patterns war for survival, fighting to propagate themselves by preying on each other." Ideas and concepts are carried on the wind in the form of whispers, "sentences with just the beginnings of syntax". Introducing new ideas into its conceptual environment, such as through speech, causes those ideas to "take root" in the Black Garden, changing the concepts present. Uldren conversing to a Cabal Legionary in Ulurant led to the whispers taking on aspects of Ulurant grammar. The Vex there sing ("faint, wraithlike notes of inhuman clarity") to "see how the Garden changes their song." The Vex are particularly interested in the Black Garden because its effects on them "[grow] them toward what they want to be." Prolonged exposure to the Black Garden's environment can be dangerous. The concepts being whispered there are potentially a contagious brainstain hazard. The Legionary who Uldren spoke too, who had been exposed to the Garden for an unknown length of time, ended up having its "secrets" grown into him in the form of thousands of tiny seeds pockmarking his skull, incidentally imparting him with some knowledge of the Vex. Initially, the only known way to access the Black Garden was through a Vex portal that required Gate Lord authority in the Valley of the Kings on Mars; the Garden existed on a separate plane, and the Vex had locked it out of time to protect it. After the Black Heart was destroyed, however, the Garden was anchored to the surface of Mars, becoming a part of contemporary time and space. During the Taken War, an Echo of Oryx and a coven of Taken broke into the Garden by burrowing to it from Tharsis Junction, creating a new entrance. Long before any living being set foot in the Garden, tales of its existence were told throughout the system. In particular, the Warlock Pujari had a vision of the Garden when he drowned in the waters of the Shores of Time. Pujari's vision mentions that the Black Garden's existence is related to the Traveler's coming to Mars. However, he is careful to point out that "This is not the beginning but it is the reason." The Traveler did not create the Garden, Pujari claims, but its actions may have allowed the Garden to come into existence, because "In these things there is always symmetry." Pujari adds, "The Garden grows in both directions. It grows into tomorrow and yesterday. The red flowers bloom forever. There are gardeners now. They came into the garden in vessels of bronze and they move through the groves in rivers of thought." The "gardeners" in question are most likely the Vex; Pujari's vision suggests that the Vex did not always inhabit the Black Garden, but entered it some time after its creation. "Everything grows here. Look at your nails." The first known human expedition into the Black Garden was a pair of Awoken from the Reef, Uldren Sov and Jolyon Till. By then, the location of the Vex gate leading to it was common knowledge, as well as the fact that it could only be entered by tricking the Vex into opening it for them. To enter it, Uldren and Jolyon provoked a Cabal attack on the gate, forcing it to activate and produce a Gate Lord to defend it, and then slipped in while it was distracted. In the Black Garden, they witnessed many bizarre sights: plants with roots of circuitry, vines with thorns shaped like letters, beetles that wrestled with each other despite being only hollow exoskeletons. They came across the site of a Cabal-Vex battle and interrogated one of the surviving legionaries, who claimed that he had been kidnapped by the Vex. They discovered that the Garden had been slowly assimilating him in the form of seeds growing into his flesh. After that point, Uldren's recollections grew surreal and dreamlike. His memories included a persistent heartbeat, fleeing through a thorny grove among fruits shaped like Ghosts, hiding with Jolyon from arguing voices, and putting his Crows through a dryer in an apartment block with a perfectly round hole in his hand. Uldren and Jolyon somehow found their way out, bringing some of the native red flowers back to the Reef. After learning of the Black Garden's existence from the Exo Stranger, the Guardian travels to the Reef to inquire the Garden's location. Queen Mara Sov and Prince Uldren reveal that a Vex portal on Mars leads to the Garden, but requires the Eye of a Vex Gate Lord to access. After obtaining the Eye, the Guardian activates the Vex spire controlling the portal and then enters the portal itself. Deep in the Garden, the Guardian discovers the Black Heart, a malevolent entity guarded by the Sol Progeny that is feeding off of the Traveler's Light, keeping it dormant. Once the Heart is destroyed, Light returns to the Traveler and it begins to heal. The Garden's dimension ceases to drift and becomes part of Mars, making it accessible to the rest of the Guardians. Later, a powerful Vex Axis Mind called The Undying Mind arrives in the Garden and attempts to revive the Black Heart with assistance from the Sol Primeval. The Mind also attempts to separate the Garden from our timeline, but it is destroyed before it can do either. During the Taken War, Oryx, the Taken King sent an expeditionary force of Taken into the garden to investigate and possibly restore the Black Heart. An Echo of Oryx and its Taken coven invaded the Garden through secret tunnels under Freehold. The Sol Divisive was overwhelmed by the Taken as the Garden became a war zone. Only through Guardian intervention were the Taken expelled. During the events of Destiny 2, the Cabal Red Legion invaded Mars and broke the Vex stalemate they had with the Cabal. In addition to occupying Mars, the Red Legion apparently destroyed the main gate used to access the Black Garden. It is unknown if the Vex can still access the Garden. Originally, Bungie planned the entrance of the Black Garden to be a hole in the wall of the subway tunnels below Freehold, but this was scrapped for being unimpressive. The entrance became a large Vex portal in the Valley of the Kings instead. The original entrance made a return in The Taken King, however, and is seen during the Story mission Tenebrous Tunnels. Prior to Destiny's release, there was speculation that the Black Garden was located on Earth or elsewhere. Bungie clarified the Garden was found on Mars.